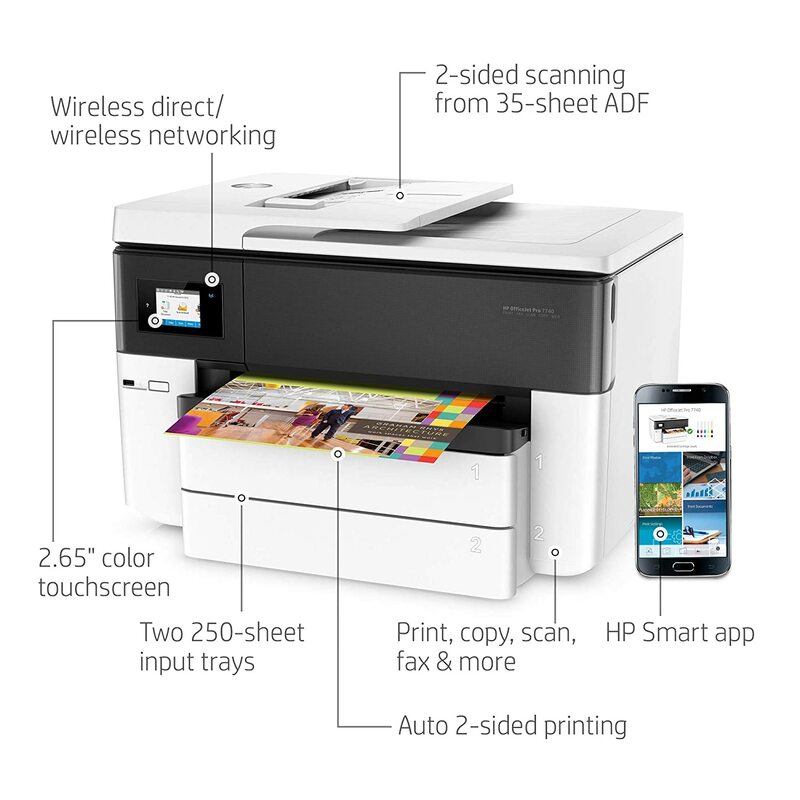 Automatic two-sided printing, fast print speeds, and an auto document feeder help ease your day.The 35-page ADF handles documents up to legal size (8.5 x 14 in), so you finish duplex jobs quickly.Tap and swipe the smartphone-style color touchscreen for timesaving shortcuts.Increase paper capacity to 500 sheets with the included second 250-sheet paper tray. Create vibrant color graphics and deep black text on a variety of papers from letter to tabloid (A3).Produce water-, smear-, and fade-resistant prints that stand up to highlighters. Print more black text and color pages with optional Original HP high-yield ink cartridges. Help your business stand out with borderless, double-sided marketing materials. Easily print documents and more from your smartphones and tablets, whether Apple®, Android™, or Windows.Easily connect this all-in-one with wireless devices, so everyone in the office can print conveniently.Easily manage printing tasks and scan on the go with the HP All-in-One Printer Remote mobile app.Help protect information and access to confidential print jobs with HP JetAdvantage Private Print.